OpenLM Server uses Firebird Embedded Server by default. By purchasing the External DB support extension, the user is licensed to use external DB such as MS SQL Server, MySQL or Firebird Server. This document describes a backup procedure to OpenLM Server. The suggested backup procedure must be tuned in order to accommodate different computing environments. This article only describes a procedure for cold backup. This method requires the system to be halted in order to assure a consistent backup file. Hot backup is recommended for critical systems and requires the support of a professional DBA. This configuration will not be discussed in this article. OpenLM uses an embedded Firebird DB by default. The database file is located by default in C:\Program Files\OpenLM\OpenLM Server\db\. The DB file name is OPENLM_DB.FDB (or OPENLM_DB.GDB in older versions). 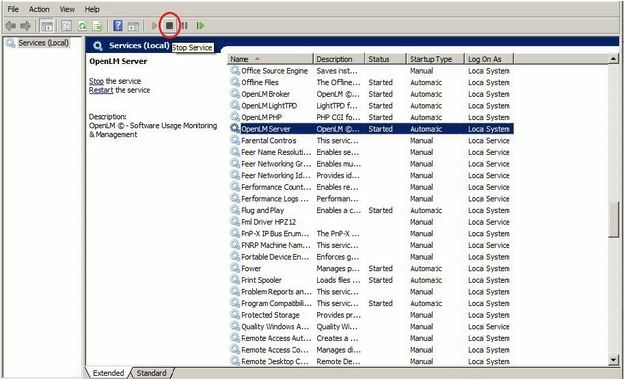 OpenLM Server supports external databases such as MS SQL Server, MySQL or Firebird Server. When using external DB, the backup is done using the DB tools, usually by a DBA. Stop OpenLM Service; the picture below shows a manual stop of the service. Backup the DB file (embedded) or the External DB.